J. Crew: Who’s That Girl? I am ready for a wonderfully relaxing weekend. How about you? Before I go, I had to share with you a new series over at JCrew.com called Who’s That Girl. 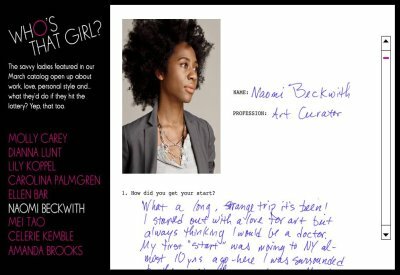 Featuring incredibly inspiring women from the world of fashion, art, and interior design, Who’s That Girl provides interviews with nine fabulous women, including New York art curator, Naomi Beckwith. If you are looking for a little bit of inspiration this weekend, check out this wonderful series. I have loved reading about these incredible women and their journeys. And of course, I love seeing them sport some J. Crew style. https://www.aphrochic.com/wp-content/uploads/2017/02/Aphrochic-logo-glow-700.png 0 0 Jeanine Hays https://www.aphrochic.com/wp-content/uploads/2017/02/Aphrochic-logo-glow-700.png Jeanine Hays2010-02-26 20:59:002010-02-26 20:59:00J. Crew: Who's That Girl? The Selby Is Coming To Your Place! Hammocks & High Tea Spring Collection!